I'm a new member of this forum. I bought an SB8K #015 last year here in the States, and I proceeded to clean it up and fix a few things. I have a simple question for the forum which has a backstory that I'll try to keep brief. Suffice to say I fiddled with things and painted myself into a corner. Admittedly, this is a self-inflicted wound. To get right to the point, I need to know the orientation of the two wires (green and blue) of the ignition sensor (spark trigger) wires as they go into the female Bimota (AMP) connector of the chassis harness. In more detail, I replaced the stator in my SB8K with a unit purchased from Suzuki because one of the yellow wires had burned . The new unit looked identical to my old one, including the wires for the spark sensor, except that it had a different plastic connector on the end. No problem I thought, I'll just swap them. About two minutes after extracting the old wires from the old connector, I realized I didn't mark which side each wire went into. 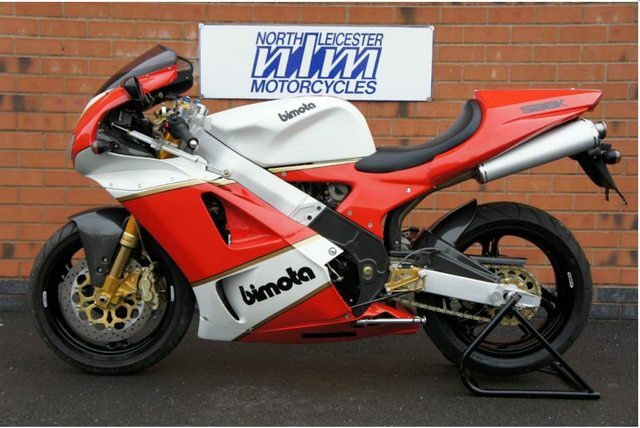 The Bimota wiring diagram was no help because it has little or no info on the colors of the wires. The male side of the connector has other colors for some reason, so I couldn't match them. As long as I'm confessing my foolishness, I figured well maybe the polarity of the sensor wires didn't matter, and I guessed at the orientation. Well, that resulted in no spark, so I reversed the polarity. Again, no spark. After realizing that I may have screwed up the ECU by doing this, depression set in. Now, I'm taking baby steps in resolving this issue, starting with verifying the correct orientation of these wires. Then I'll tackle any ECU issues. I've attached a link to a photo of the connector. If someone can provide a picture of the connector on their SB8K (or just tell me), specifically detailing the orientation of the blue and green wire with respect to the locking side of the female connector, that would help immensely. I'm open to any other advice or assistance on this matter. Hi sterlz , and welcome to the forum. Just to clarify , when you say SB8K do mean SB8K or SB8K Santamonica ?? Sorry to split hairs and not trying to be funny , but it makes a huge difference in wiring/ECU. Hi vort28, thanks for the reply. Not splitting hairs at all. I have a Santamonica. Welcome and sorry to hear about your admission! The burning of the stator wires is common, it is caused by the voltage regulator calling for a higher charging voltage than it really needs. Even though you might not have the crank trigger wires indexed correctly, it should still crank and run. Changing the index of the wires changes the orientation of the sine wave that the ecu uses to determine correct crankshaft position. At worst it should only be a few degrees off, but it should still run, but not 100%. When you cut the key on, do you hear some noise from the gas tank? You should hear the fuel pump cut on for about 3 sec`s before cutting off. You should also hear the injector servo motor doing it's little dance. You also need to be very carefull when you wash the bike. The ecu is not really sealed correctly and water could enter the unit. Thanks for the reply SB8 Tuner. Nice to know that the reverse polarity would still create a spark, just not perfectly. I figured that might be true, but I wasn't sure. Hopefully, I haven't caused any damage to the ECU. Yes, the fuel pump turns on when the key is turned and the servo motor does it's dance as it should. I used the Suzuki TL1000R service manual to diagnose the problem, using the "no spark" troubleshooting section. I verified there was proper voltage from the crank trigger. I verified the kick stand switch was operating correctly. I verified the gear selector switch was operating correctly. I verified the coils have correct resistance on primary and secondary. I haven't washed the bike since I've had it, so the ECU didn't get wet. I tried starting the engine with kick stand up, clutch lever pulled in, AND gear in neutral. Still no spark. I've got the front spark plug removed and grounded to the engine for testing. 1. I noticed there is no voltage at the primary winding on the coils when key is turned on (but not cranking). Seems to me there should be, but with all the lock out circuits to keep the engine from starting when kick stand down, in gear, etc., it may be one of these that's causing the issue. 2. At some point, I did unplug the gear switch connector and reconnect it. The book says don't do that with the key on, as it can cause damage to the ECU. I read that after the fact, and I don't remember if the key was on or not when I reconnected it. I'm not sure what kind of damage that would cause. Good to know the fuel pump and injectors come to life. That means the ecu is booting up correctly. Check the camshaft position sensor according to the TL manual. You will find it on top of the rear valve cover. Which manual said to not unplug the gear selector connector with the key on? If it was the TL manual, the bike does not have the same ecu. When I first got my Santa, did the same sort of thing, started it, played with it , cleaned it, started it , cleaned a bit more, went to start it , no spark. Would crank but not even try to fire. Went through a few things could not find anything, still no spark. Got some new plugs , started first time !! They don't like being started and not run, think they run extra rich for the first X minutes ( can't remember exactly how long, getting old !!) and this can kill the plugs. 1. I will check the camshaft position sensor coupler, as I did have it disconnected at one time. 2. The "book" that says not to disconnect the gear switch when the key is on is indeed the TL manual, pg. 7-17. Good to know it doesn't affect the Bimota ECU. 3. I will check the spark plugs with a test unit, even though they are brand new. 4. The battery has already been disconnected numerous times during this process. 5. I'll make sure all the connectors to the ECU and Control Center are properly connected. It was the camshaft (not crankshaft) position sensor coupler. One of the wires had come loose, probably when I removed the coupler previously. The only clue was one of the small blue silicone accordion-like jackets around the wires was protruding from the end of the coupler. The other wire had its little blue jacket flush. Not much to go on, but when I tugged delicately on it, a bare wire emerged. I happened to have the correct connectors and crimping tools, and after reconnecting everything, voila, a nice blue spark appeared when I cranked the engine. Good thing nobody was around to witness my enthusiastic victory dance! I never would have guessed it to be the camshaft position sensor. This sensor is not mentioned in the TL manual when troubleshooting no spark, at least not by name. I don't even know what information it could provide that the crankshaft position sensor couldn't. Anyway, thank you guys for all your suggestions. Much appreciated. I still wouldn't mind knowing the answer to my original question regarding the correct orientation of the crankshaft position sensor wires. If anyone with a Santamonica wants to go to the trouble of removing their left side fairing and looking at the two-wire connector aft of the battery with a blue and green wire, I would be grateful. You can simply let me know if the picture in my first post is correct or not. Note that the picture shows the orientation with the locking mechanism on top. No need for anyone to run out and check the orientation of the crankshaft position sensor wiring as I requested. I figured out that one way the bike runs nicely, and the other way it doesn't. So therefore, I don't need anyone to verify the configuration on their Santamonica. The orientation is blue on left and green on right with the locking mechanism facing up, same as in the picture I posted.